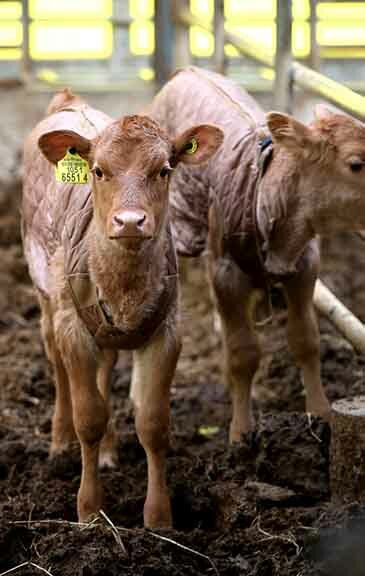 Farmers put a padded winter clothing on the newly-born calves in a farm in the southern part of South Korea as the cold temperature kept hitting the entire nation as of Dec. 13 (Wednesday), 2017. On the day the cold temperature plummeted to as low as minus 12 degree Celsius in Seoul and most of the other areas of South Korea recorded sub-zero temperature. On day earlier on Dec. 12 (Tuesday), 2017, people in Seoul felt as if the temperature was minus 19 degrees Celsius because of the wind chill effects. In the central part of Chuncheon area, where lots of lakes, are temperature dropped to as low as minus 15 degrees Celsius. The cold front from Siberia started hitting the entire Korean Peninsular earlier this week. The sub-zero cold temperature will continue until Dec. 14 (Thursday), 2017, according to Korea Meteorological Administration (KMA).